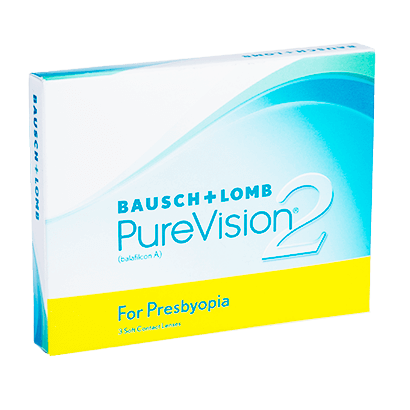 PureVision2 for Presbyopia contact lenses are monthly disposable lenses as part of the renowned PureVision range, designed by expert manufacturers Bausch & Lomb. The multifocal contact lenses allow for easy focus and improve your visual clarity at all distances. If you suffer from lens dryness, these PureVision2 for Presbyopia contacts are an ideal choice for you. Their consistent surface and thin, rounded-edge profile provides outstanding comfort throughout the day. Those after prolonged wear for their lenses will enjoy the use of silicone hydrogel material that allows more oxygen into the eye. Correction of presbyopia is a more natural process with PureVision2 for Presbyopia contact lenses. This is down to the smooth transitions that are facilitated by the contact lenses, which feature a 3-Zone Progressive design. For more information on presbyopia, read our helpful guide. 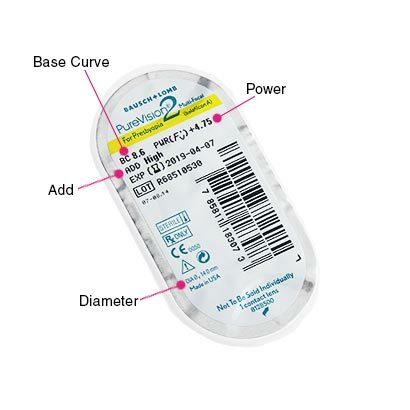 These lenses can either be worn daily as monthly disposables, or daily and nightly as extended wear for up to 30 days, provided you seek approval from your eye care professional. Wearing monthly contact lenses will be simple with our wide range of multi-purpose solutions. For everything you need in one bottle, why not try our best selling comfi All-in-One Solution? Buy and save more with our 6-pack edition, for amazing value for money. Biofinity Multifocal and Air Optix Aqua Multifocal are similar monthly multifocal lenses. Great Products. Great Customer Service. Love this product and would highly recommend to anyone. 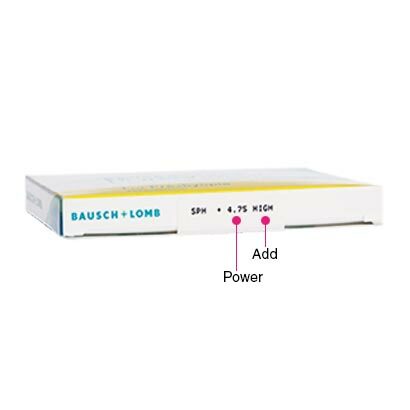 Be aware these are not as good as Pure Vision Multi-focal No good for near vision I though my Eyes were getting worse but it was the quality of the contact lenses. Version 2 is a big backwards step. Very dissopointed this new type “pureVision 2 “multifocal monthly wear lenses.!!!!!!!!!!!!!!!!!!!!! I could not focus and could not see with them at all and my eyes get sore :(((((( they all the time moves from one side eye to another and get blur my eyes with them compared to the original “pureVision”multifocal lenses that I had been using for the past 10 years. BUT you stop to sale them:((((((( This new type of “Purevison2” is are awful!!!!!! I paid for them but can’t wear them!!!!! Will be nice if you start to sale original type “Purevison” multifocal lenses again or I never will buy the lenses from you! Wonderful and comfortable. Love the slightly blue tint in the actual lens itself so you can see it in the solution. Wondered if there was any way of indicating on the actual lens if it''s right or left because my eyes don''t have the same strength? Or is there something already there that I''ve not noticed? very good product. Very unclear as to how to apply collected points to your order. This has helped me read without having to don on reading glasses in addition to my contact lenses. Highly recommended! !